Cheesy "Que-Beck" dad joke aside, Beck really did make himself at home in Quebec City on Thursday night. Headlining the Bell Stage, the petite rock star sauntered on to the stage to a blast of thunderous noise, then quickly launched into "Devil's Haircut." Next was "Loser," proving that it's not always necessary to save the biggest hits for the end of the set. Just the second song in, it elicited a massive sing-along from the packed field of tens of thousands. 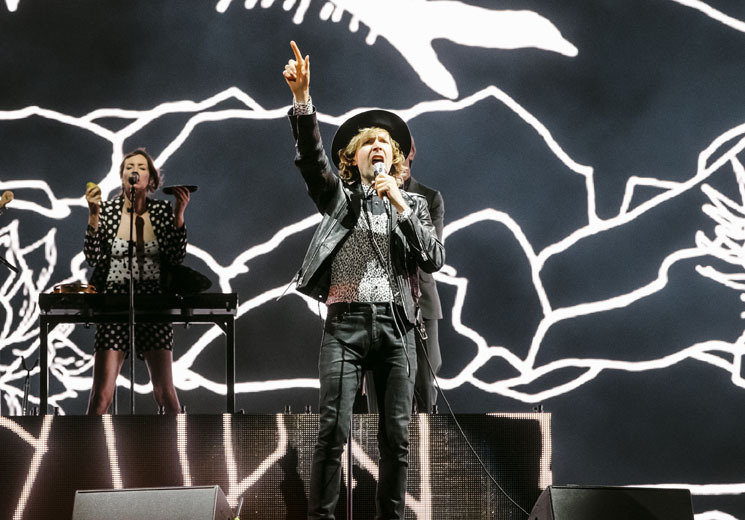 Donning a black leather jacket, black-and-white leopard print blouse and a black hat, Beck was joined by an eclectic and entertaining backing band that mostly followed suit in black-and-white ensembles. They instead brought colour to the stage with their musicianship, a backdrop of wildly kaleidoscopic visual projections and, well, songs off Beck's latest album Colors. "Up All Night," "Wow," "I'm So Free," "Dreams" and "Colors" all came to life onstage, outshining their fairly lacklustre recorded counterparts. It was older tunes that received the most enthusiastic response, though, with "The New Pollution," "Girl" and "E-Pro" especially standing out. A solo acoustic version of "Debra" even turned into a kind of rousing rendition of Prince's "Raspberry Beret" (though the audience was a little shaky on any lyrics beyond the titular phrase), and Morning Phase highlight "Blue Moon" was reworked into a gorgeous acoustic group number that saw Beck and his band stepping onto the lower riser of the stage. Equally comfortable shredding his guitar as he was goofily dancing across the stage with just a mic in hand, Beck was an exemplary showman and gracious band leader all evening, taking the last portion of the show to introduce his killer band during "Where It's At" (interspersed with meandering solos and covers), before closing out the night with a blowout honkytonk rendition of "One Foot in the Grave." It was a vibrant performance from a seasoned vet, who showed us that he's clearly not done coming up with exciting ways to entertain his fans.